LAS VEGAS – There’s something special that happens when athletes reach toward their championship dreams. That’s the case for 12 men who will be part of the Bullfighters Only Las Vegas Championship qualifier round, set for 3:30 p.m. Friday, Dec. 2, and Saturday, Dec. 3, at the Las Vegas Convention Center. The bullfighters will battle for four remaining spots in the BFO Las Vegas Championship, set for Dec. 7-10 at the Hard Rock Hotel & Casino. Tickets for that are on sale now at AXS.com. Thiessen will be joined in the qualifier by Ross Johnson, Dakota Knight, Erick Schwindt, Aaron Reemer, Jon Roberts, Travis Gidley, Tate Rhoads, Kyle Lippincott, Blake Miller, Bryce Redo and Judd Napier. Four bullfighters will advance and be part of the mix that features the top 12 men in the BFO, all of whom received a bye into the second weekend. The opportunities in Las Vegas are as grand as the city itself. The BFO Las Vegas Championship will be the richest event in freestyle bullfighting history. Bullfighters Only has changed the face of freestyle bullfighting and brought it back into the mainstream. It’s a man-vs.-beast battle filled with danger as the bullfighters test their athleticism against aggressive and equally athletic bulls. These men have earned the right to be part of the mix. They will have to further prove themselves inside the Convention Center in order to advance to the BFO Las Vegas Championship. That’s just part of the honor for the men in the qualifier. The opportunity is grand, but so is the talent in the mix. It’s what will make for amazing competition. Though it’s only a minute, freestyle is intense and magnificent. Done well, it’s like a dance in the dirt; if things go wrong, the chances of a big wreck increase mightily. It takes stamina, guts and pure will to come out victorious. Every man in the field has been preparing for this opportunity, whether through regular workouts or through added cardio exercises. 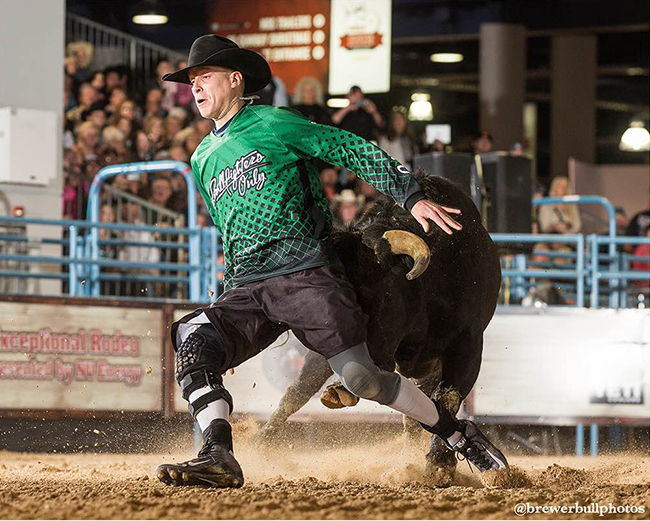 For Thiessen, he’s working out twice a day to get his mind and body ready for the fights ahead, training in Montana with fellow BFO bullfighter Nate Jestes, who will make his first WNFR appearance in the Thomas & Mack Arena this December. That confidence is a major factor in any man’s success, and it takes great inner strength to tangle with the beast. It’s just another reason why freestyle bullfighting is a true spectator’s sport.